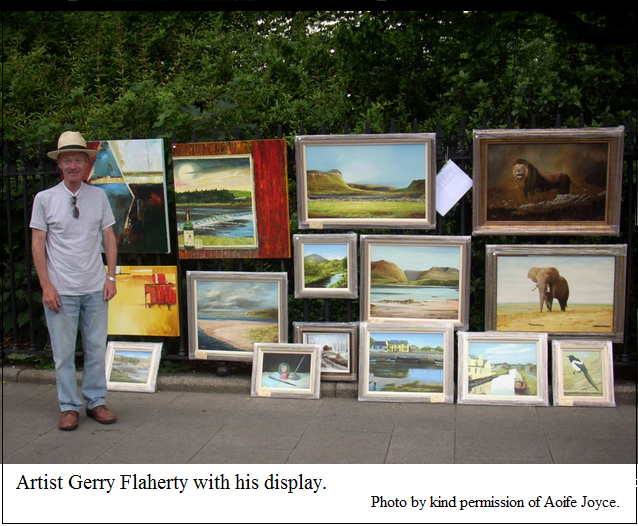 More Irish Art than you could shake a stick at! With the weather promised settled until well into next week there’s no excuse not to get out there and visit some of the Great Irish Art on show. Kicking off with The People’s Art on Stephen’s Green www.peoplesart.eu this Friday/Saturday & Sunday; Merrion Square Art www.merrionart.com on Sunday, and the Dublin Painting & Sketching Club Annual Exhibition runs at the Dun Laoghaire/Rathdown County Hall in Dun Laoghaire from the 8th-21st May. For those of you who prefer to view your art from the couch, there’s always my new site which is growing in leaps and bounds. I have been so busy adding to it that I’ve completely lost track of how many artists are now listed. The scarcity of information on each artist is gradually being rectified – it’s purely a matter of getting time to collate the hundreds of pages of research that I’ve already accumulated while continuing to gather more information. With some living artists it’s like pulling teeth. Check out the latest additions below. People’s Art on the Green – YouTube video by Pervaneh Matthews.